"Quick and easy pesto to top your pasta. A great change from red sauce." 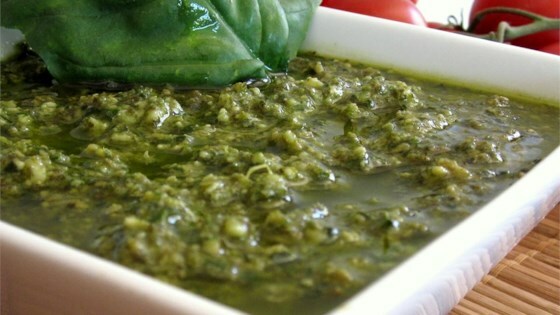 In a food processor, blend together basil leaves, nuts, garlic, and cheese. Pour in oil slowly while still mixing. Stir in salt and pepper. A classic pesto sauce with basil, walnuts, garlic, and Parmesan. The proportion of ingredients were perfect! And its a relief to know that the more affordable walnut can be used instead of the rather expensive pine nut without casualty. Thanks. Very good. I didn't have walnuts; so I used pine nuts. I wanted to make it a little less fattening. In place of the 1 cup of olive oil, I used 1/2 cup chicken broth and 1/2 cup olive oil. Good recipe! I halved the amount of oil, and tripled the amount of cheese. Awesome!